Carlton D. Kline, Jr., 91, of Danbury, CT passed away on January 14, 2019 at Saint John Paul II Center in Danbury, CT after a 7 year battle with Alzheimer’s disease. He was born on January 5, 1928 in Albany, NY to Carlton D. Kline, Sr. and Ruth Hoffman Kline. He graduated from Scarsdale High School and Edgewood Jr. College and was an Army veteran. He retired from American Can Co. in 1988. Carlton was a Little league umpire for many years in Ridgefield, CT. 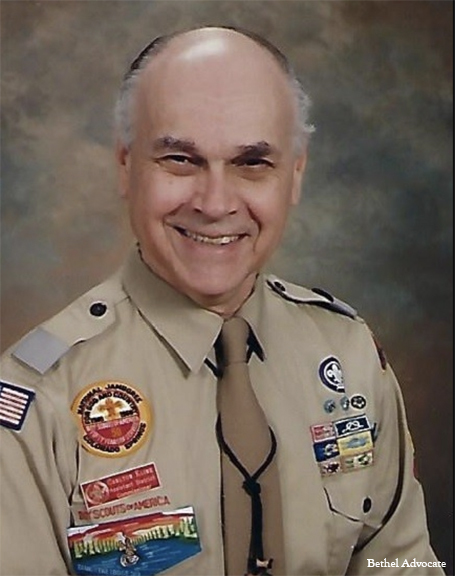 He held many positions within the Boy Scout organization, especially during the many years he lived in Bethel, CT. He was very proud to be an Eagle Scout, achieving this honor at the age of 16. He worked for many years at Putnam Park in Redding in the Visitors Center and the museum. He enjoyed being a Revolutionary War reenactor. Carlton is survived by his wife of 33 years, Deborah, of Greenwich, CT, and his four children: Elizabeth Conroy (Lawrence) of Bethel, CT, John of Bethel, CT, William (Stacey) of Nairn, MI, Suzanne Martin (Dennell Muckerman) of Bantam, CT; seven grandchildren: Spencer, Chelsea & Dustin Martin, Kristina Olszewski, Laura Belardinelli-Shaw, Suzanne Melillo & Michael Kline; four great-grandchildren: Samantha & Lucas Melillo, Olivia Olszewski and Hayden Anne Belardinelli-Shaw and stepsons: Robert Husted of Studio City, CA and Jeff Husted of Danbury, CT. Carlton is also survived by his sister-in-law Linda Buckheit (Douglas) of Milford, CT and Terrence Flanagan (Felice) of Trumbull, CT. as well as two nieces and a nephew. A Mass of Christian burial will be held at St. Mary’s church, Bethel on Friday, January 18, 2018 at 10:00 AM followed by private burial at St. Mary’s cemetery in Rye Brook, NY. There are no calling hours. The family would like to thank the staff at Saint John Paul II Center for the wonderful care given to Carlton. In lieu of flowers, contributions may be made to the Alzheimer’s Assn. or The Boy Scouts of America. To light a candle or leave an on-line condolence, please visit Hullfuneralservice.com.